Its purpose was to translate into English and classify selected news articles appearing in the Chicago area foreign language press from 1861 to 1938. "The Chicago Foreign Language Press Survey is a collection of translations of newspaper articles originally published in Chicago's ethnic press between the 1860s and the 1930s. The Chicago Public Library administered the project that created this collection in the 1930s, with funding from the U.S. Federal Works Progress Administration (WPA). The Press Survey was one of many initiatives during the Great Depression that employed Americans to document and enrich national culture. "Translators and editors organized nearly 50,000 articles from 22 ethnic groups according to a hierarchical subject scheme created for the project. In total, the Survey produced approximately 120,000 sheets of typescript. The paper sheets are now cared for in the Special Collections Research Center at the University of Chicago, and several institutions hold copies of the microfilm. The Library of the University of Illinois at Urbana Champaign digitized its microfilm copy and contributed the files to the Internet Archive. In 2009 the Newberry Library received a grant from the National Endowment for the Humanities to create a new digital transcription of the Survey. The 1930s project intended to offer English-speaking researchers and students access to primary materials on ethnicity and urban life in one of America's great polyglot cities during a formative span of its history. "In subsequent decades the Survey has been invaluable to scholars and students of Chicago history, and it has been used effectively in high school and college classrooms. This digital collection is intended to provide broader and better organized access than has been possible with paper and microfilm. The Survey translations have considerable value for teaching and research in immigration studies, urban history, the history of popular culture, and many other fields." What does this have to do with Norwegian-Americans? The serendipity of random Google searches can lead you to some interesting, previously unknown, web sites. This was the scenario for my locating this online database. It's a bit unusual in that it's a digitization of a transcription initiative that occurred over 80 years ago. It makes the result of WPA workers' tenacious hard work accessible to researchers of the 21st century. I've spent some time on the website, which contains collections from 21 different ethic groups, such as Chinese, Italian, Polish, Croatian, and Russian. One of the ethnic groups is Norwegian. 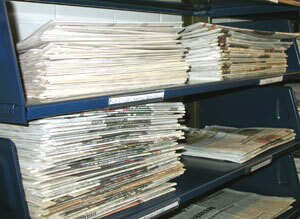 The collection holds transcriptions from one journal, five books and eleven newspapers. Below is a list of these items. I've provided a bit of annotation beyond what is available on the website, including live links to descriptions of the Norwegian newspapers. The Skandinaven was one of the oldest and longest-lasting of the newspapers. It was established by three Norwegian immigrants: John Anderson, Knud Langeland and Iver Lawson. The Library of Congress has microfilm of this newspaper in its collection. You can also find it at three historical societies (Wisconsin, North Dakota, and New York), and at Luther College and Harvard University. But if you don't have access to these institutions, the Foreign Language Press is the next best thing. Not everything has been transcribed, but it's a beginning, and it will make you anxious to see more. If you choose to explore this resource, I would be most interested in hearing about what you find. Please post your feedback and comments below. I just spent an hour enjoying a bit of history. I look forward to returning and reading more of early Norwegians in America. Thanks for linking this sight! Thanks for reading "Nearby Norwegians," Moo Moo!